"I've always been scared of women, but I get over it." Life could not be worse for Alicia Huberman (Ingrid Bergman). The authorities have imprisoned her father for treason, and he expresses no remorse for his actions. Both the press and the police are keeping a close eye on every move that she makes. Plus, her excessive drinking and supposed promiscuity have become public knowledge. Little hope exists in the heart of this beautiful young woman. While drowning her sorrows in alcohol at a drab party, Alicia meets Mr. Devlin (Cary Grant)�a mysterious, unemotional figure working for the Brazilian government. The two unlikely companions begin a surprising love affair that appears to have a bright future. Unfortunately, Alicia's disreputable role in the government's plans strikes a rift in their relationship that may never mend. Alfred Hitchcock's Notorious wonderfully combines passionate romance within the conventions of a suspense thriller. Utilizing unparalleled camera work, Hitchcock leads the audience through the tight story without a chance for a breath. Each shot features numerous points of interest that lead to a complex and invigorating viewing experience. The star power and magnetism of Ingrid Bergman and Cary Grant could carry the romantic elements and create an effective film. However, Hitchcock strives for more than a by-the-numbers love story with a few tense scenes. The result is a nail-biting, emotional picture that grabs you and keeps you pinned to your seat through each successive scene. The two spellbinding leads sizzle on the screen, and their separation disrupts the viewer as much as the two lovers. Alex Sebastian (Claude Rains) and his Nazi companions have concocted a diabolical plan to cause significant pain to the Allies in some form. Devlin's office must enlist Alicia's help in stopping the Nazi's mischievous goals. She must utilize her charms to infiltrate Sebastian's home and then discover the truth behind their schemes. This creates a destructive rift in Devlin and Alicia's burgeoning relationship. Sebastian is completely smitten with his former crush, and the plan works brilliantly. Unfortunately, she may lose Devlin forever because of the emotional pain of this dangerous role. This is only a secondary problem, however. The true power in the Sebastian family�his overbearing mother (Leopoldine Konstantin)�waits patiently for Alicia to slip up and reveal her true aims. If a mistake occurs, the result could be deadly. Throughout the story, Hitchcock heightens both the visual beauty and tension through his excellent use of the subjective camera. Numerous scenes spring directly from the eyes of the central characters, especially Alicia. This aligns the audience with the person's mindset and reveals the true weight of the situation. When Alicia first meets the German group at Alex's party, they loom closely and represent a clear menace in her eyes. On the surface, this meeting is a harmless group of introductions with some new acquaintances. Given Alicia's knowledge of their unethical activities, the camera gazes towards them in a frightening manner and reveals her own nervousness in their presence. Also, Hitchcock does not limit our access to the heroes of the film. The shots follow Alex's jealous eyes several times while he tries to discover the nature of Alicia's relationship with Devlin. The subjective camera can sometimes feel like a gimmick in the wrong hands, but it works perfectly for Hitchcock and draws us nicely into the story. 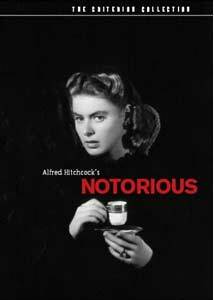 When I watched Notorious for the first time several years ago, I felt that the love story originated too quickly. Devlin and Alicia meet at a party, talk a few times, and then fall in love. Everything seemed too perfect, and this reduced my overall enjoyment. Upon a second viewing, however, the fairy-tale quality of the entire story became more evident. Devlin literally sweeps Alicia off her feet in the beginning, and then she is forced to live in a castle of evildoers. The conclusion stems more from Sleeping Beauty than the spy genre, and it places the earlier events in the proper context. This approach makes it much easier to become closely involved in the romantic side of this film. The Sebastian residence features a large entry room with a looming staircase that appears to rise for miles and miles. This sizeable stone structure contains large doors that block access to unknown antechambers. Although this luxurious home should appear warm and inviting, it actually looks cold and frightening. This originates from the expressionistic nature of the shots and the foreboding set design. Very little life exists here, and Hitchcock captures this atmosphere perfectly by shooting from awkward angles. The use of depth-of-field to tell the story is astounding and superbly presents the character's relationships through their position in each shot. This is the type of film that rewards repeated viewings because it is impossible to catch everything the first time. Notorious succeeds grandly in both the romantic and suspense genres, but it also has an interesting historical side. Released shortly after the conclusion of World War II, it showcases the Nazis as the primary villains of the time period. These vicious enemies will callously murder their own members if they even make a minor mistake. Amazingly, screenwriter Ben Hecht (Spellbound, Scarface) has created a gripping tale where specific details are unnecessary. We know the enemies are Nazis, so it automatically signifies that their ultimate plan must be terrible. Plus, our thoughts remain focused on Grant and Bergman, which makes the fine points of the plot less essential. Seldom have both stars acted with such confidence and grace, and their chemistry helps to create compelling cinema. Image Transfer Review: Notorious comes in a full-frame transfer restored from the original camera negative and several other prints. The result is arguably the best transfer ever released for this film. Given the age of the source material, the bright, black-and-white picture shines and presents the sights of Rio de Janeiro in all their glory. There are a significant amount of defects on this disc, but they appear to stem from the original prints instead of this digital version. It is not one of the top restorations ever done for DVD, but the final result is still impressive. Audio Transfer Review: Similar to the image transfer, this mono audio track received a major restoration for this release. Considering its origins, this is an eye-opening soundtrack that really brings Hitchcock's best attributes to the forefront. The dialogue is clear and easily understandable, and the romantic score moves nicely through the speakers. It's easier to appreciate this transfer while listening to the isolated music track, which presents the clarity of each sound effect. It's limited by its mono technology, but it still works nicely and presents an entertaining viewing experience. Extras Review: This Criterion Collection release of Notorious contains an excellent collection of extra features that provides a complete picture of this classic film. The highlight is two equally interesting commentaries from Hitchcock film scholar Marian Keane and film historian Rudy Behlmer�editor of Memo from David O' Selznick. Keane tackles each scene and reveals the subtext behind Hitchcock's camera use and ideas. Her knowledge helps to explain elements of the story that aren't as obvious, and she speaks in a down-to-earth manner that is easily understandable. This track would work wonderfully for film classes as a way to easily explain each nuance of this complex visual creation. While Keane covers the film itself, Behlmer looks more at the overall production and its history. He discusses a variety of elements, including the short story Song of the Dragon, Selznick's ideas for the story, and the career of writer Ben Hecht. Behlmer provides a completely different side that complements Keane nicely to paint a intriguing picture of the overall film. This disc also features a much-need isolated music track that nicely conveys the essential role of music and sound effects in this tale. It's amazing to notice points where dialogue in not even necessary to understand the events on the screen. For example, in the wine cellar scene, the camera makes each action clear without the use of dialogue. This visual mastery combined perfectly with the sound effect helps to raise the suspense to another level. Sound is used for a different purpose on the 1948 Lux Radio Theatre adaptation of Notorious. Starring Ingrid Bergman, Joseph Cotton (for Grant), and Joseph Kearns (for Rains), this one-hour presentation effectively presents a shortened version of the story. Accompanied by a nice index with 11 chapter cues, this 3-act version also features a silly commercial for a cleaning product during the intermission. The major portion of the supplements appear in a section labeled the Notorious Dossier, which includes numerous photographs, several featurettes, several preview trailers, and other impressive additions. It's especially interesting to read the scripted scenes that were cut from the filmed version. Text introductions and visuals clearly explain the supposed placement of each moment and the reason for its deletion. There's also four alternate endings that never made the script. Several expound of Sebastian's fate and reveal the imminent marriage of Devlin and Alicia. Another compelling extra is the production correspondence between Selznick and various others, including FBI chief J. Edgar Hoover. Accompanied by photographs, these brief letters reveal a few of the thought processes that lead to the creation of the film. It was also interesting to discover the tremendous use of rear projection in this story. Hitchcock hated location shoots because of the loss of control, so he filmed the actors at sound studios in Hollywood with the projected scenes from Rio behind them. Several brief featurettes also cover certain nice tidbits, including Ingrid Bergman presenting Hitchcock with the Unica Key at the 1979 AFI Tribute. It's these type of elements that raise this disc about the usual special editions. Besides the essential commentaries and expected information, Criterion has included some lesser known, fascinating items. This attention to detail makes this release one of the best older titles on the market. Film critics have differing opinions about what constitutes the best Hitchcock film. Although it may not be worthy of this title (North by Northwest is my favorite), Notorious definitely showcases the director at top form. Packed with supplements, this Criterion Collection release is a must-own for Hitchcock fans and film lovers of all ages.